It’s that time of year when the nights are drawing in and we’re starting to feel the call of cosy days at home. It’s beginning to go dark here in the late afternoon, when there’s still so much playing time left in the day. 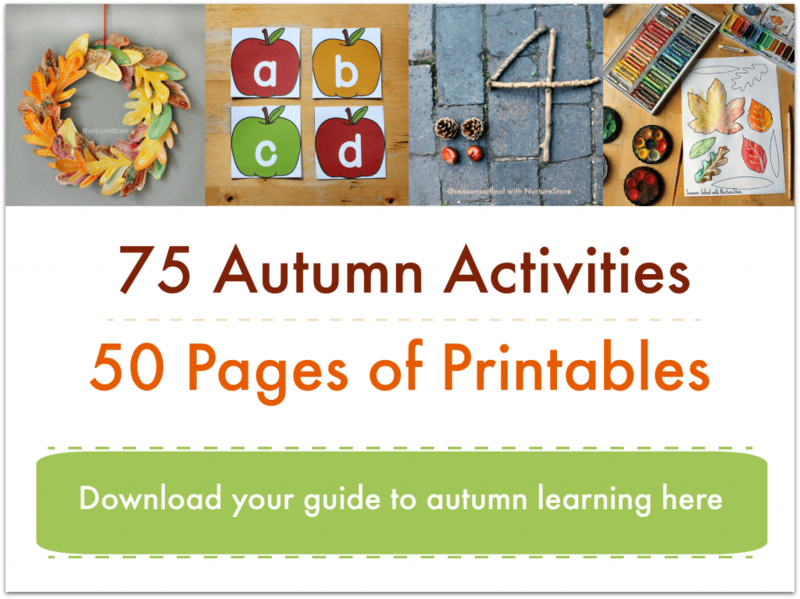 And, rather than complain that we can’t play outside so much, we’re welcoming the seasonal change and looking for ways to play indoors that really complement the coming winter. 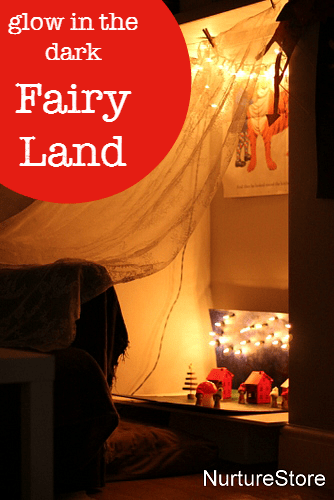 This fairy land makes use of a dark, neglected corner of our home, and fills it with magical light and imaginary play. 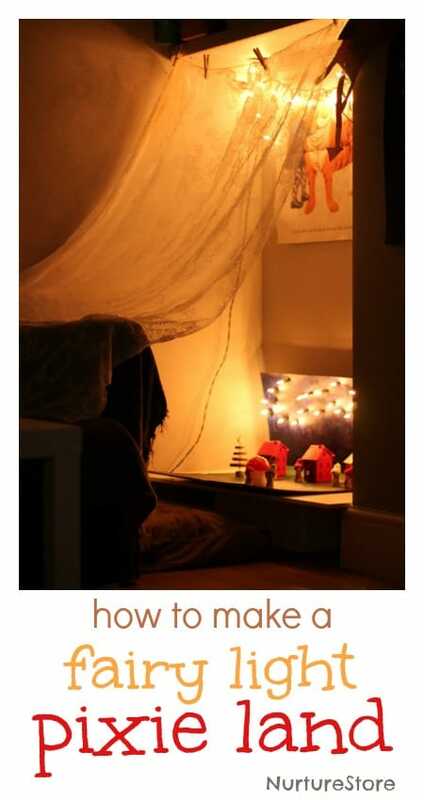 And it’s really easy, and inexpensive, to make. As an alternative to an expensive light table, I used some recycled cardboard packaging and one string of fairy lights to make this fairy land. 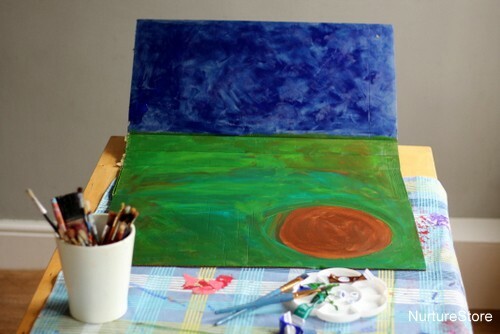 To begin with I painted a dark winter sky and a grassy meadow onto a piece of a cardboard box. 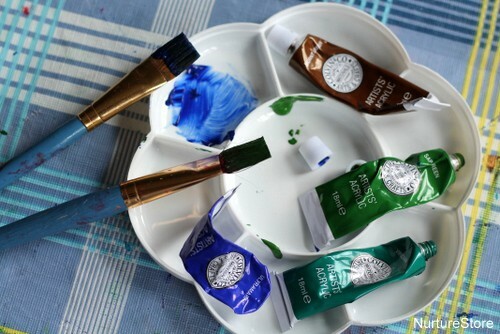 I used acrylic paint to give good coverage and provide a robust surface for lots of play. Then I used one string of twenty fairy lights to make some stars in the night sky. I used a pencil (not the light bulb!) 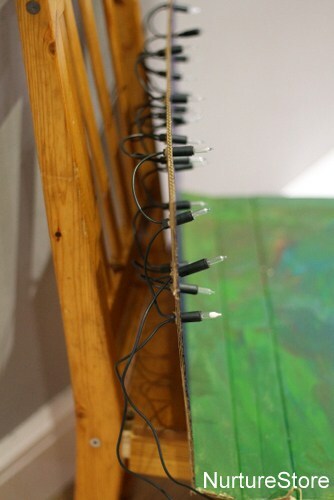 to poke a holes in the cardboard and then gently pushed the fairy lights through. Then we added in some items to play with. 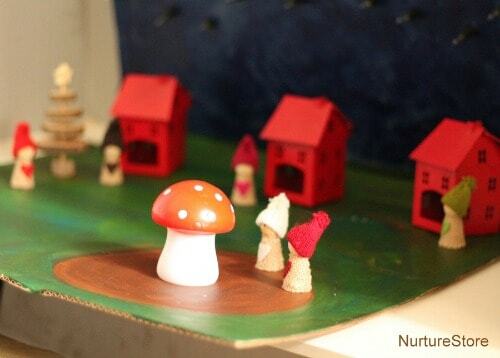 The little pixies and tree are Christmas decorations, the sweet red houses are are candle holders. All are from Hobbycraft. You could also make your own fairies and houses – take a look at the links at the end of this post to see how. 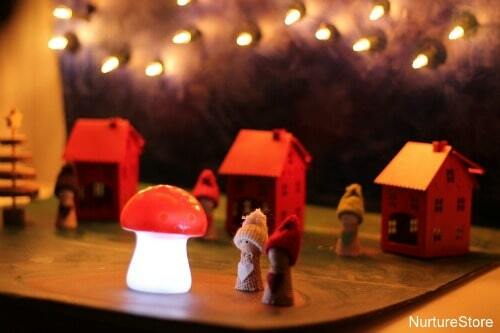 The mushroom was from Cherry Menlove’s online store – and it lights up! 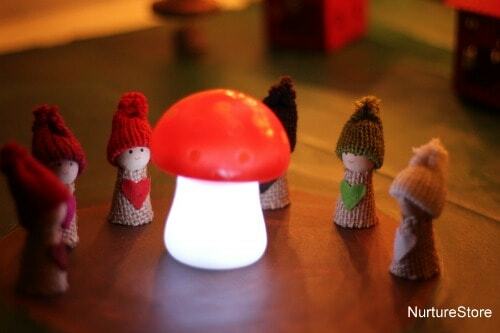 The fairy land is fun to play with at any time, but once it’s dark outside and the lights are turned on, it becomes a really special place. I’ve set it up in an under-used corner of our play room. We usually have this space set up as a book nook, but the children prefer to use the sofa for stories nowadays, so this corner was rather neglected. Now though, lit with the fairy lights, it’s like a magnet, pulling children in to investigate and play! I have placed the fairy land on an upturned box to give it stability, and set it alongside a nice big cushion, so there’s somewhere comfortable to sit. You’ll notice there’s an extra sting of fairy lights above too. 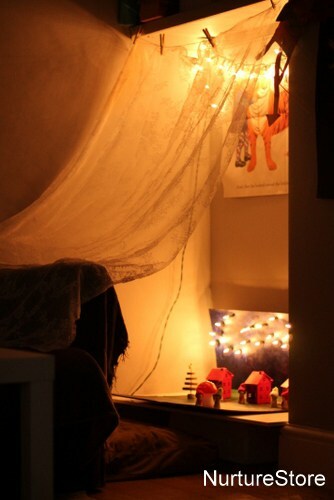 A piece of net curtain pegged to a washing line provides a soft canopy overhead, making this a really cosy, welcoming spot to enjoy the sensory lights, and some imaginary play. This is such a lovely idea! I love the coziness of the lights in the photos. I can imagine lots of imaginative and narrative play happening in such a nice place.